To say the Learjet 70 and 75 are versions of the 40/45 updated with new Garmin G5000 avionics is accurate, but there is more to the newer models than just the flight deck. Every upgrade is an opportunity to improve the marque, and Bombardier engineers certainly did that. The $13.8 million Learjet 75 is the pinnacle of the classic Bill Lear design that probably did more to usher in the business jet than any other aircraft. It retains the classic Learjet layout but is equipped with the latest Garmin G5000 integrated flight deck and a modern interior that maximizes space in Bombardier’s sole light jet product. The 40/45 was Bombardier’s first new design in the iconic Learjet line after the purchase of Learjet in 1990. The 70/75 was the first jet to enter service with Garmin’s G5000 touchscreen-controlled flight deck and also the first to be designed with a pocket door. In 2017, Bombardier celebrated delivery of the 3,000th Learjet, 54 years after the Learjet 23 was certified. To Bombardier's credit, it has kept the Learjet production line running in Wichita, even though sales of the 70/75 have dropped. During this production run, Bombardier has delivered 132 Learjet 40/40XRs, 454 45/45XRs, and nearly 130 70/75s. Bombardier remains committed to the Learjet line, and both the 70 and 75 remain in production. 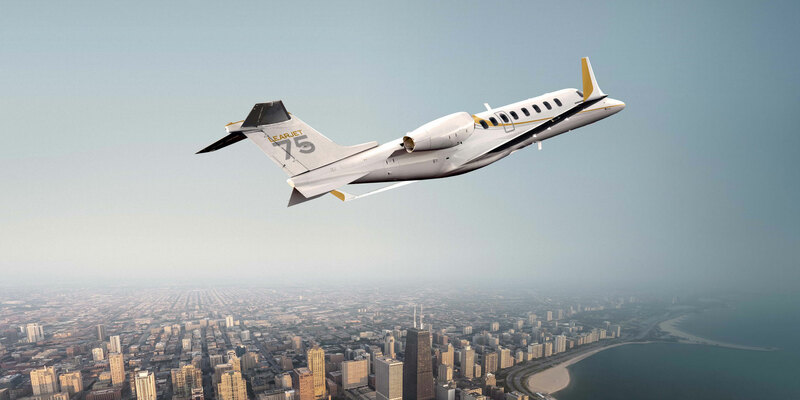 During the first three quarters of 2018 Bombardier delivered nine of both the Learjet 70 and 75, and final quarter sales were expected to climb thanks to the new U.S. tax law’s bonus depreciation. The total reached 14 in 2017 and 24 in 2016. The 70 and 75 are basically the same airplane, both powered by the 3,850 pound thrust Honeywell TFE731-40BR turbofan, but differing in cabin length and range/payload capability. The Learjet 70’s cabin is 17 feet, 8 inches long and seats up to seven passengers. Maximum range with four passengers and two pilots is 2,060 nm, and maximum payload is 175 lb greater than the Learjet 75’s at 2,285 pounds versus 2,110 pounds. Both have the same maximum takeoff weight (mtow) of 21,500 pounds and carry the same amount of fuel, 6,062 pounds. The Learjet 75’s cabin measures 19 feet, 10 inches and range is nearly the same at 2,040 nm, with a typically equipped capacity of up to nine passengers. Two key competitors for the Learjet 75 are Embraer’s Phenom 300 and Textron Aviation’s Citation CJ4. The Learjet is certified to FAA Part 25 regulations, however, while the Phenom 300 and CJ4 are certified under Part 23. Certification to Part 25 regulations requires meeting higher standards for bird-strike requirements, flight control redundancy, rotor-burst protection, ice testing, and takeoff performance after engine failure. The Learjet 75 beats its competitors in cabin volume, boasting 364 cu ft versus the Phenom 300’s 327 cu ft and the CJ4’s 295 cu ft. The Learjet’s cabin height is 4 feet, 11 inches and width is 5 ft,eet 1 inch, the same dimensions as the Phenom 300, although the Phenom’s cabin length is more than two feet shorter at 17 feet, 2 inches. The CJ4 cabin measures 4 feet, 9 inches high and 4 feet, 10 inches wide and is 17 feet, 4 inches long. With a top speed of Mach .81, the Learjet 75 edges out the Phenom 300 at Mach .78 and the CJ4 at Mach .77. High-speed cruise in the Learjet is Mach .79 and typical cruise speed Mach .76. From a range perspective, the Phenom 300 can fly 1,971 nm with six occupants, while the CJ4 can fly 2,165 nm (number of occupants not specified). The Learjet 75 standard interior consists of two four-seat, double-club seating areas in a flat-floor cabin with a forward galley opposite the entry door and an aft lavatory with its own window and a belted seat. A pocket door between the cabin and the galley/entry door area quiets the cabin by up to 8 dB SIL, making it possible for passengers across from each other or even in the opposite zone to hear each other. The cabin management system is Lufthansa Technik’s nice system with niceview moving-map. The Learjet 75 standard interior consists of two four-seat, double-club seating areas in a flat-floor cabin with a forward galley opposite the entry door and an aft lavatory with its own window and a belted seat. Each seat except the one next to the emergency exit is equipped with a popup 7-inch touchscreen monitor mounted in the side ledge. Passengers can see and control the monitors while they are in the stowed position, or they can also use a mobile device app to control the nice system. A larger 12-inch HD monitor is mounted on the forward bulkhead. The touchscreens control the lights and cabin environment, but each seat also has dedicated switches for overhead and table lights. The emergency exit seat has a smaller 4.3-inch monitor. A Blu-ray player opposite the galley stores up to 250 movies that can be served to any of the seat monitors. User content can also be viewed via USB ports at each seat, and there is an HDMI port located at the VIP seat. Universal power outlets are fitted between each seat as well. The immersive sound system uses transducers instead of speakers. The VIP seat controls the bulkhead monitor and all lights, although each passenger can control their own lights. The VIP controls can be assigned to any seat. Window blinds are manually adjustable and can be set to fully dark, shear (allowing some light through), or completely open. Leather inserts are an option for the tables between the club seats. The normal table can’t be fitted on the right rear where the emergency exit is located, so for those two seats, a plug-in table is available. When not in use, the plug-in table is stowed in a cabinet behind the left rear seat. Each cabin seat has a small “candy” drawer at the bottom. An optional seat back and track option allows the seats to move farther back, and the seats can even be tilted back and, with their seat pads removed, reversed to make a sleeping surface. The lavatory can store up to 150 pounds of baggage in 15 cu ft, secured by a cargo net. The 50 cu ft external baggage compartment is heated but not pressurized and can carry up to 500 pounds. It is long enough to store surfboards and golf bags. The Learjet 75’s clamshell entry door saves cabin space up front and allows room for an optional galley rest seat, which is usable only in flight. The galley has plenty of storage space and a hot liquid dispenser. A microwave oven is an option. Gogo Business Aviation air-to-ground connectivity is available for domestic U.S. operators, and Gogo’s Inmarsat SwiftBroadband satcom is an option for international travel. The cabin altitude at typical cruising altitude of FL450 is 6,450 feet. The Learjet 75’s maximum operating altitude is FL510, where the cabin altitude is 8,000 feet. Automatic lights in the entry area, flight deck, and on the pylon near the rear baggage door switch on when opening the cabin door. A pushbutton next to the cabin door switches these lights back on if the timer times out. A dedicated AC alternator supplies the two-ply windshield with electricity for heating. Dual-wheel main landing gear are equipped with carbon brakes, and thrust reversers improve landing performance and allow pilots to take full landing credit on contaminated runways. Nosewheel steering is digitally controlled via the rudder pedals, with up to 60 degrees’ turning at slow speeds and limited to 7 degrees once speed reaches 70 knots. In towing configuration, the nosewheel can pivot 360 degrees, with the sole limitation the configuration of the towbar. Fuel tanks can be pressure-filled or by gravity filling. The gravity port is mounted on the upper right side of the rear fuselage, and the fuel panel is under the right engine pylon. There is no provision for overwing fueling. The fuselage tank flows into the wings then engines to maintain balance. The Honeywell RE-100(LJ) auxiliary power unit (APU) is approved for unattended use, but is only for ground operations and not while in flight. The Honeywell TFE731-40BR engines are flat-rated to ISA +23 degrees C, but automatic power reserve (APR) extends the flat-rating to ISA +27 degrees to deliver more thrust in a one-engine-inoperative situation or emergency such as windshear. Aileron fences improve roll control at low speeds, even in a full stall. When rolling more than five degrees, spoilerons extend to augment roll control and they can also provide roll control in case the ailerons jam. The Garmin G5000-based Vision avionics suite is a vast improvement for the Learjet line and makes the front office of the Learjet 75 look more modern and much less cluttered than the previous models. The Learjet 75 is equipped with the latest Garmin G5000 integrated flight deck. Three 14-inch WXGA high-resolution displays populate the panel, supported by two GTC 570 touchscreen controllers below on a tilt at the top of the between-seats console. Above the displays are three panels, the flight guidance panel in the center for autopilot and navigation and two identical panels in front of each pilot for baro setting, PFD settings, range, and buttons for flight planning and procedures selection. The touchscreen controllers are infrared technology, which means that they can be actuated with ordinary gloves, a pencil eraser, or finger. The center display has an always-on section for engine instruments, fuel readouts, gear/flaps/spoiler indicators, trims, and CAS messages. The rest of the screen can be a single pane, for example, a moving-map, or split into two panes, with a moving-map on one side and systems synoptics, charts, etc., on the other side. Each pilot can control the center MFD by taking over priority. On the two PFDs, Garmin’s Synthetic Vision Technology is standard. WAAS-LPV is standard as is ADS-B Out. Performance planning and management enables full takeoff and landing data (TOLD) calculations. Also new is weather information, with graphical worldwide weather delivered via Garmin GSR-56 Iridium satcom and U.S. weather information from SiriusXM Weather. The GSR-56 can also be used for inflight text messaging. Controller-pilot datalink communications for the European ATN-B1 (formerly Link 2000+) requirement is optional. An upcoming update to the G5000 software in the second half of 2019 will make possible an optional FANS 1/A+ upgrade as well as the Flight Stream 510 wireless gateway for Connext services (also optional). The upgrade will also include smart airspace decluttering, visual approaches, and a flight path angle reference cue. This upgrade will be available for in-service Learjet 70/75s. The demo flight took off from Wichita. It was a perfect Wichita day in early November when I joined Bombardier senior production flight test pilot Ken Wise for a flight in the Learjet 75. The winds were gusting from 17 to 22 knots from the northwest, not unusual for Wichita. With three occupants—myself, Wise, and production flight test pilot Nick Weyers—and 4,000 pounds of fuel, the Learjet weighed 18,236 pounds. Maximum ramp weight is 21,750 and mtow is 21,500. The G5000-calculated takeoff speeds were V1: 109; Vr: 113; and V2: 123 knots. Steering a Learjet on a ground takes a little getting used to as the digitally controlled nosewheel is super sensitive. However, the steering is also precise and gives the pilot lots of control, and in tight spaces it’s possible to turn within one wingspan. Once underway, just slight pressure on a rudder pedal was all that I needed to keep the nose exactly where I wanted. Lined up on Runway 1L, I advanced the power levers three detents to the takeoff setting, and the TFE731s accelerated promptly and pushed us firmly back in our seats. Wise’s speed calls came quickly, and I pulled back on the yoke to rotate—it didn’t take much of a pull—and set the aircraft symbol into the flight director command bar, about 9 degrees on the attitude indicator. After retracting the landing gear and flaps, I set the power to maximum continuous (MCT) and began trimming for about 15 degrees, which Wise had recommended for setting up the climb. Turning on the autopilot and setting flight level change (FLC) for the climb using the FMS climb schedule (250 knots to 10,000 feet then 275 knots until transitioning to Mach .73), we flew east towards Butler, Kansas, climbing at about 4,000 fpm. Wise wanted to demonstrate the effect of anti-icing on the climb, so I switched the system on at 17,000 feet and the climb rate dropped to 3,300 fpm. Climbing through FL210, I turned the anti-ice off and the climb rate rose to 3,700 fpm. We had to level off for ATC at FL230 then FL310 and FL350 before proceeding to FL410. At FL410 with maximum continuous power set, the Learjet 75 sped along at Mach .80, burning about 700 pph per engine at ISA + 3 deg C. Wise pulled the left engine to idle and deselected the right bleed-air system to demonstrate how the remaining system could maintain the 6,000-foot cabin altitude on its own. Slowing to Mach .78 and a true airspeed of 462 knots, fuel flow dropped to just over 500 pph per engine, and Wise said that the Learjet 75 flies along comfortably and efficiently at this speed. After climbing to FL430, I shut off the autopilot and tried some 45-degree banked turns, using the G5000 flight-path marker to help maintain a level attitude. There was zero wing buffet, and pitch and roll control felt solid and crisp. “This airplane has plenty of wing,” Wise said. While the Learjet 75 does not have an automatic emergency descent mode, steep descents are quick when using the spoilers. I tried actuating the spoilers rapidly, and there was no sharp bump or trim change as they extended. We set a FLC descent at 320 kias, near MMO, and dropped at more than 7,000 fpm. “It doesn’t take long to get down if you want to,” he said. Back below Class A airspace, we worked our way towards Hutchinson, Kansas and practiced some slow-speed handling so I could get used to the landing configuration. I set up the RNAV approach to Runway 31, which is an easy process with the Garmin avionics: push the PROC button on the touchscreen controller, then select the desired approach for the destination airport, plug in the 1,770-foot msl decision altitude, and then brief the approach. Pulling up the approach chart is a simple matter of pushing the “Charts” button and selecting the applicable chart. The plan was to fly the missed approach procedure, and I hand-flew the approach, trying out the G5000’s cross-pointer setting for the flight director, which Wise prefers. I’m used to the V-bars, and the cross-pointers were a little confusing for me. We intercepted the final approach course and followed the LPV vertical path, the Learjet easily plowing through the gusty winds. Once at minimums, I pushed the TO/GA button on the left power lever, raised the nose and pushed the levers to the takeoff setting. Wise set flaps 8, then retracted the landing gear and flaps. We then followed the missed approach procedure until resetting the nav to return to Wichita. I programmed the autopilot to fly us to intercept the ILS approach to Runway 1L, planning for a touch-and-go. After turning the autopilot off, Wise could tell that the cross pointer flight director was hindering me and he switched me back to the command bar. The Learjet 75 handled perfectly, responding swiftly and precisely to my control inputs as I crabbed into the left crosswind and followed the glideslope down to the runway. He disarmed the spoilers so they wouldn’t activate after landing. After a few gusty bumps between 100 and 200 feet, I transitioned to slightly left wing low into the crosswind at about 100 feet and initially pulled the nose up too soon, but then allowed it to drop and raised it just slightly for the touchdown, which was a little firm. Wise set flaps 20 and checked the trim setting, then I advanced the power levers three detents—click, click, click—to takeoff power, centered the ailerons, and lifted off as Wise called out rotation speed. I had to pull the power back and trim rapidly to keep from rocketing through pattern altitude while climbing at 180 knots, then set up for our final landing. This time I managed to keep from pulling the nose too high over the runway, and the landing was smoother. We slowed quickly, aided by the spoilers and thrust reversers, and as I taxied back to the Bombardier hangars, Wise started the APU. The last Learjets still in production are still strong contenders for a light jet purchase, with speed and range that combine with a roomy cabin to deliver an efficient mode of travel. For pilots, the 70 and 75 models are pure Learjet, not just in appearance but also performance and handling. It would be nice to see further development of the Learjet line, but that might have to wait for a significant upturn in the lighter end of the business jet market.